Red Flame was inspired by a night spent in Groningen, Netherlands, whilst Katrina and the composer were attending the 2005 European Brass Band Championships. Queens night was in full flow outside, but whilst we were inside, there was a kind of surreal calm. However, that all changed as soon as we headed into the centre of Groningen, where the streets were full of happy people, all singing and dancing (And drinking!). The title refers to one particular drink in a bar that came to us on fire! The work was commissioned by, and dedicated to, Katrina Marzella. 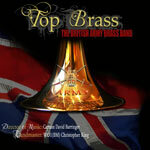 Artists: British Army Brass Band / Andrew Porter (euphonium) / - cond.